"Who knoweth not in all these that the hand of the LORD hath wrought this?" "And all things are for your sakes, that the abundant grace might through the thanksgiving of many redound to the glory of God. 2 Cor. 4:15 What HE hath wrought HE has done so for HIS glory." "Oh ok thank you guys :) Amen"
"9 Who knoweth not in all these that the hand of the LORD hath wrought this? 10 In whose hand is the soul of every living thing, and the breath of all mankind. Amen!!" "God is always in control"
"I needed that verse today." "I've never gone through trials like Job did. But we have his example to help us deal with such trials, should they come. And in the end, the Lord will show mercy (read James 5:11)." "Job understood the sovereignty of God"
"Maria, Job acknowledges Gods omnipotence, Job believes in God and knows God has all power in heaven and earth. God don't have to answer to man." "What does that have to do with the WORD OF GOD? NOTHING!!! SATAN INTERFERRING WITH ANOTHER VERSE FROM GOD'S HOLY WORD!!! I DON'T CARE ABOUT THE "SAMSUNG GALAXY 54 GIVEAWAY...IT'S ANOTHER PLOY USED BY THE DEVIL TO DISTRACT ONESELF FROM THE WORD OF GOD!!!" "Wrought...molded, shaped, worked..worked up. Maria Catalina Ibarra-Wilson." "Yah,ai Job da wsnt aware dat he ws denyng da comfrt 4rm hs 3friends,ai he is complainng bt he is an upright man,he didnt curse God as satan thought wen he ws wit da Lord..."
"I love this bible verse, GOD is in all the time in control." "Father God, He knew us before the laying of the foundation of the world, Scripture states the Lord knew us"
"EVERY single breath and heartbeat of ours, was preordained before the foundation of this world was laid, by our Lord and Saviour Jesus Christ. Praise the Lord!" "God has a sense of humor when he asks us what would you do if you were God, and laughs at our answers. He doesn't need our help doing the right things, just a body to speak through, where he can show his image to a lost and dying world." "Even man's greatest invention can not compare to God Living creatures." "God givith life to all things that breaths. He uses all things for His glory. He either uses us as vessels of honor, or vessels of dishonor. Thank you Father for using me as an vessel of honor. Use me in any manor that pleases you. Help me to be selfless. All the glory to you my God. Amen..."
"I knew everything had a soul! Our animals will go to Heaven!" "Only The Mighty God of heaven can make a tiny insignificant creature to hold everyone at awe!!" "Yuck.. i hate this looking thing had one in my hair long time ago and thought it wasnt never gonna get out.. yuck makes chilles all over me.."
"Amen!..Our God has a sense of humor too..I think He had some fun creating this beautiful creature!" "Amen! Who are we to question God." "The LORD has the world in a jug and he has the stopper in his hand .amen .!!!" "Amen,I Amen brother Wesley;Job Is Awesome!xoxoxo"
"Funny when I first seen this frog remind me of Mick Jagger in jeans"
"Gods creatures all of them to." 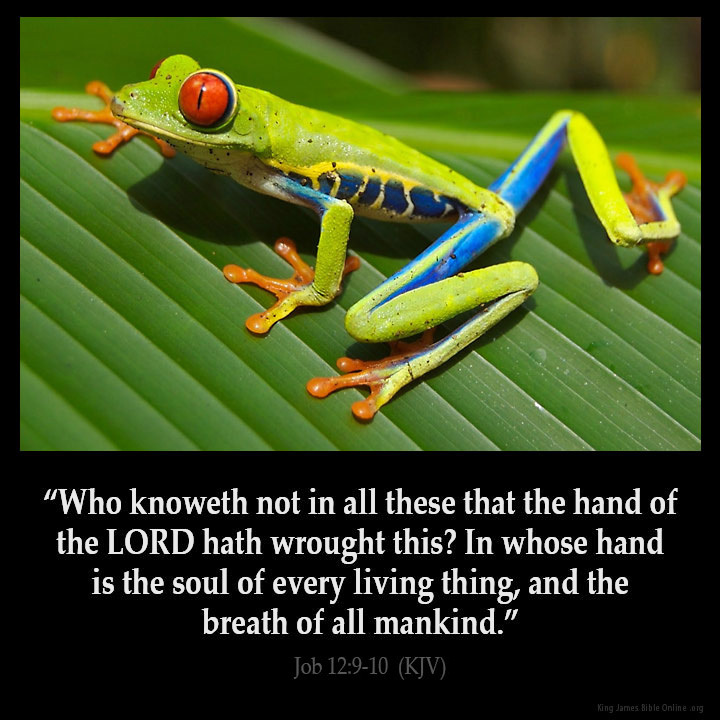 "I also say Amen our God of job is Awesome"
"In God's hands the only thing you can trust"
"In whose hand is the soul of every living thing, and the breath of all mankind. Wow! This is mind blowing when you really think about it. What an awesome God we serve!!" "What a beautiful frog my favorite !!!!" "What a blessing, to have dominion over the earth and every creature." "Yes AMEN Praise the Lord in His Highest Amen"
What Do You Think of Job 12?